With DigitalBlanks USA micro-perforated Jumbo door hangers you can make your ad campaign or any door hanger project easy, effective and efficient. Made on a quality White 90 lb index stock this sheet is perfect for digital printing applications including, laser printing, color and black copy machines. Clean cuts and easy handling are hallmarks of this handy product. Each finished door hanger is 4 1/4" x 11" with a 1 1/4" perforated knob hole with a convenient slit for fast separation and ease of use. These are DigitalBlanks Laser Jumbo Door Hanger. Each sheet is 11" x 8 1/2" with 2 micro perforated door hangers per sheet for a total of 50 sheets per pack providing 100 Jumbo Door Hangers. This product works great, prints easy, tears apart easy, and does the job. 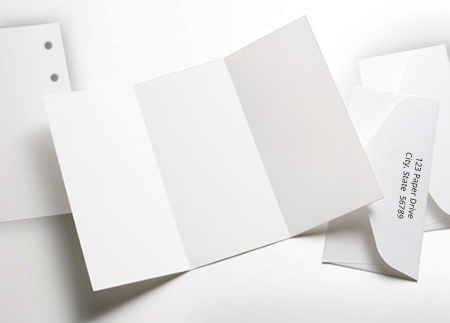 This is a standard 8.5" x 11" sheet that readily fits all printer and copier trays. The 90# stock paper had no problem feeding through printers. The perforations were good and left clean lines on the paper. This product will be used to distribute church information throughout the community. We were looking at visitor window tags for our apartment complex, and were shocked at the very high cost. These made a great alternative. Thanks Paper Mill. I purchased this to use for a small outreach related to our VBS. These printed so easily and separated with no problems. I had no problems and was pleased with the quality. Also the template was simple to download and update with our information. Used these for a ministry project at church. The end product turned out wonderfully and was of high quality. Paper stock could have been a bit heavier but still it was good enough to produce a great final piece. Used this for a special project for "Teacher Appreciation" Day. Worked great in my home printer, just what I needed. I work for a small service company, and every so often a customer fails to show up for their scheduled appointment. 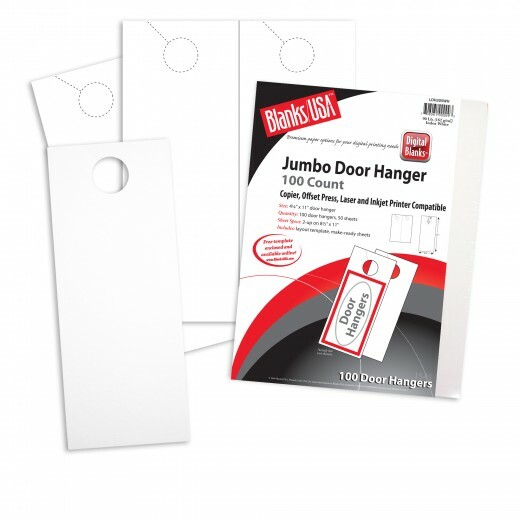 We looked into purchasing door hangers so that we can alert our customers to the mixup, and instruct them to call us to reschedule. Since we don't use them often, the pricing to have them professionally made was just not worth it. We opted to go this route - purchasing the paper stock and designing ourselves inhouse - and it was a great decision. The paperweight is heavy and perfect for printing on both sides. This was a really great investment for the price.